Gladys Hall obituary. Carnes Funeral Home. Gladys Hall was born on November 5, 1924 in Mt. Enterprise, Texas to Elisha and Sarah Wesley, though living most of her life in Dickinson, Texas. She completed her life’s journey on December 17, 2018. Gladys married Ernest “Pappy” Hall on August 14, 1954. They spent 43 years devoted to each other until he was called to rest on September 12, 1997. 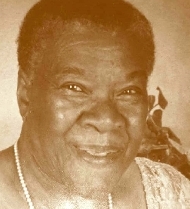 She was a loyal and faithful wife, joining him at Greater New Hope Missionary Baptist Church where she served on the Women’s Missionary and the Usher’s Board. Gladys was a woman of good humor, grace and quiet strength. Gladys found solace and great joy in cooking, gardening (in which she was exceptionally blessed), and spending time with her children and grandchildren. She is survived by her children, Lee Porter (Jeri) of Dickinson, TX; daughters, Ruby Jean Neal of Dallas, TX; Annie Porter of Dickinson, TX; Shari Lynn Billiard (Steve) of Houston, TX; Vanessa Rodriguez of Dickinson, TX; and Ernest Craig Hall (Sherri) of Houston, TX; brothers, E.W Wesley of Dallas, TX and Randall Wesley (Belinda) of Houston, TX; sister, Sarah Watkins of Gardenia, CA; seventeen grandchildren; twenty-seven great-grandchildren and three great-great grandchildren. Special cousin Erma Jean Young; and special friends Barbara Ross and Estella Nichols. There will be a church service held on December 29, 2018 at Mt. Carmel Baptist Church at 11am located at 2920 State Hwy 3, DIckinson, Texas 77539. Burial to follow at Forest Park East in Webster, Texas.